"This area is a national holy ground, 'ground zero' for American art," remarks art historian Jason Rosenfeld. Thomas Cole, founder of the Hudson River School, set up a studio in a farmhouse in Catskill in 1827. 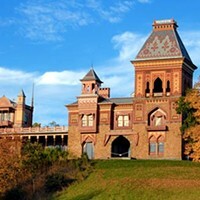 Frederick Church, his chief disciple (and only pupil), constructed Olana, a magnificent mansion across the river, near Hudson, beginning in 1870. "River Crossings: Contemporary Art Comes Home" is the first exhibition jointly sponsored by Olana and the Thomas Cole House. It opens May 3. Artist Stephen Hannock, whose work is inspired by the Hudson River School, was asked to organize the exhibition, and called on his friend and collaborator, Jason Rosenfeld, to co-curate. 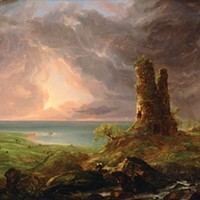 The two have a unique relationship, having met while Rosenfeld was lecturing on a Thomas Cole painting at the Metropolitan Museum almost 20 years ago. Rosenfeld has curated two of Hannock's shows and written a monograph on his work. "The initial idea was to think about the legacy of Church and Cole, and about the art that might interest them today," Rosenfeld explains. Their thesis is that the founders of the Hudson River School were radicals of their time, forging the first distinctive American art style. Contemporary artists continue this mission, in numerous mediums: painting, sculpture, installation, photography, video. 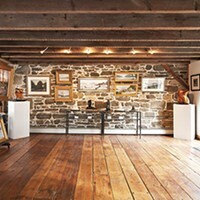 Hannock and Rosenfeld searched for artists in the Hudson Valley, but also along the pathway of the Erie Canal, and in Massachusetts's Pioneer Valley. Hannock queried his colleagues, and Rosenfeld discovered young artists at the Whitney Biennial: hermetic abstractionist Elijah Burgher, born in Kingston, and Kianja Strobert, who's currently showing her daring expressionist paintings—some with handprints—at the Studio Museum in Harlem. Angie Keefer, another Biennial alum, offers a brightly lit photograph of houses in Hudson that Keefer has painted gold. The co-curators were impressed by the willingness of artists to participate in "River Crossings," to create a dialogue with the "Old Masters" of American art. Cindy Sherman chose a black-and-white self-portrait from 1977, in which she wears a mask and a party dress—looking like a cross between Batman and Marilyn Monroe. Another self-portrait, by Chuck Close, is an eight-foot-long tapestry from 2013. Romare Bearden's collage Prelude to Farewell illustrates an enigmatic domestic conversation. The playful painter Elizabeth Murray is represented by Untitled (After Golden Delicious) II, a childlike red curve on a smeary yellow background. Kiki Smith's piece is a noble bronze wolf. Martin Puryear, whom Rosenfeld calls "America's greatest living sculptor," contributes a large sculpture, Question, set in the Court Hall of Olana. It's a wooden arch vaguely resembling an ostrich with its head buried in the ground. In this context, what does Question question? The continued meaning of the Hudson River school? The value of neo-Moorish Victorian architecture? The exhibition fills both Olana and the Thomas Cole House, and continues outdoors, with sculptures by Don Gummer set around Frederick Church's lake. Elyn Zimmerman built four viewing stands dotted around the 250 acres of Olana. Made of wood and tile, they mimic the designs Church used in his architectural plans. "In a way, the landscape is one of Church's paintings come to life," notes Rosenfeld. In contemporary art, one need not paint a view; one may simply bring the viewer inside the vista. In the 1840s, Thomas Cole would hang his new paintings, still wet, on the walls of his house, for visitors to see. Two centuries later, fresh American art returns to his rooms. "River Crossings" is on view at Olana and the Thomas Cole National Historic Site May 3 through November 1. (518) 828-0135 (Olana); (518) 943-7465 (Cole House); Rivercrossings.org.